Is there a bigger no-brainer in gaming that isn't happening right now than Minecraft's absence on all Nintendo gaming machines? 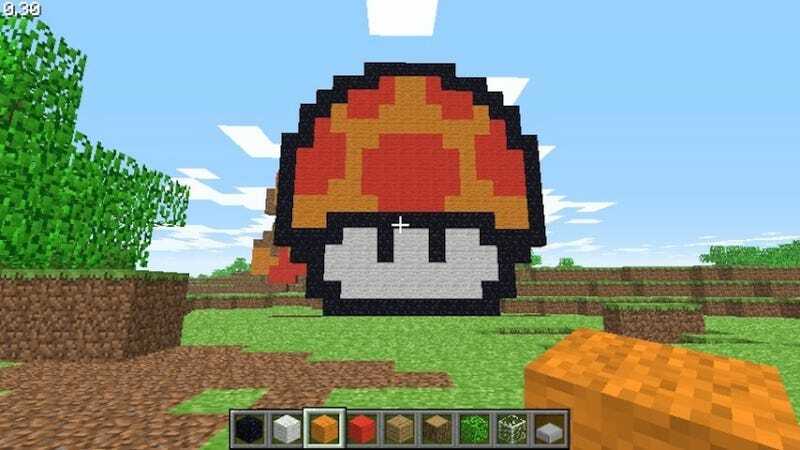 But these Nintendo tributes in actual games of Minecraft are..
Nintendo fans play Minecraft. They just can't play it on Nintendo systems. The mind boggles as to how this can be. We've beaten this drum before. Today's PS3 release and Apple charts just make the situation more absurd. Not since Nintendo let Grand Theft Auto III avoid the GameCube a decade ago has there been as glaring an omission of a game the world loves from a Nintendo platform. I've asked Minecraft studio Mojang before why Minecraft on Nintendo hasn't happened. I've asked Nintendo. I've never gotten a clear answer. In September, a Nintendo rep told GameSpot: "We're big fans. We have a continuing relationship with Mojang, and respect all the work that they're doing, but no announcements at this time." Tomorrow, Nintendo will hold a Nintendo Direct covering games coming out this spring on 3DS and Wii U. I have no inside info. I'm not hinting. I'm just shaking my head and saying tomorrow would be a good time to announce something. UPDATE: Here's Minecraft creator Notch who handed the day-to-day running of Minecraft to colleagues of his at Mojang some time ago. He's responding to someone who asked him about this post and why the game isn't on Nintendo platforms. Curiouser and curiouser!